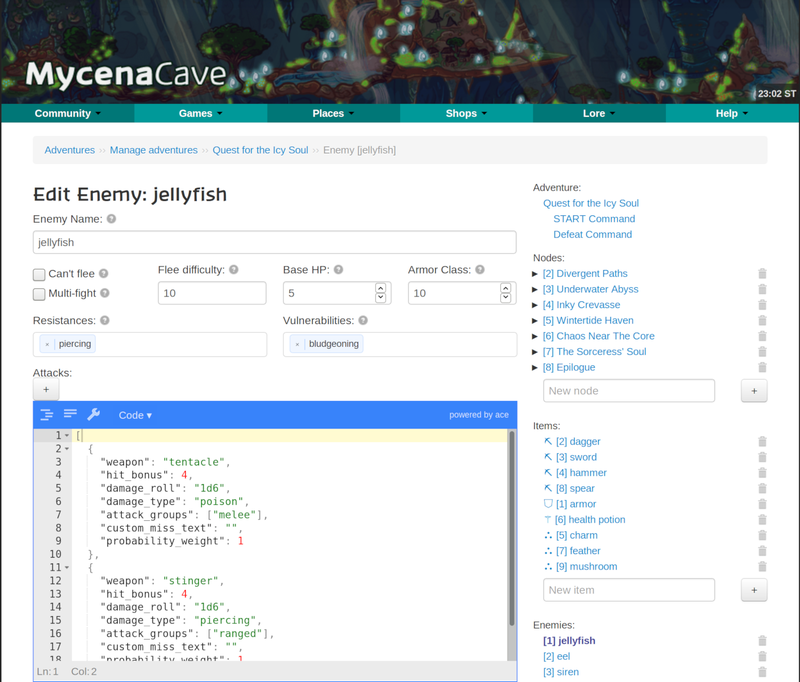 As you may be aware, we’ve been hard at work on the Mycena Cave Adventure System since February, and have been working closely with some of you in a Closed Beta program since the early June. Many of you experienced some of what this feature could offer during its alpha release in the Quest for the Icy Soul event in February. Since then, it has grown in leaps and bounds, in part from your feedback, but especially from the tireless efforts of our various teams of beta testers. 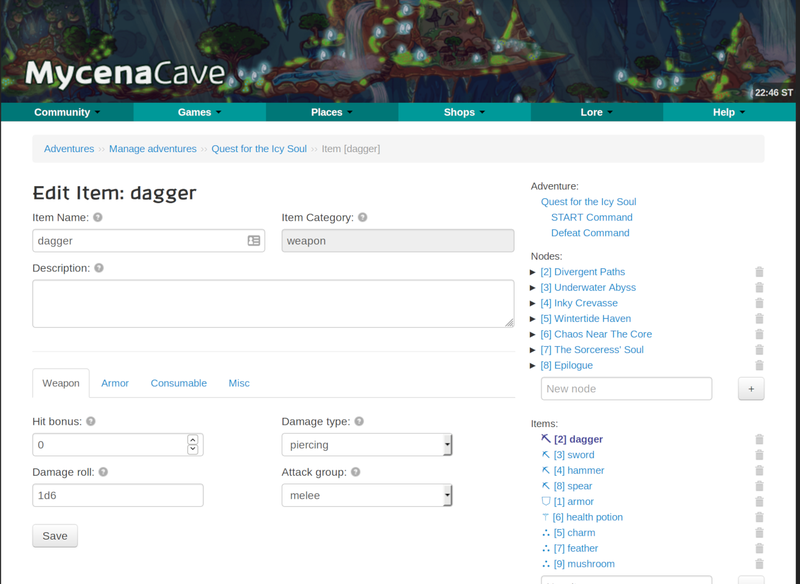 I’m excited to announce that our closed beta is coming to a… well, a close! This means a few things: that we are no longer looking for new beta testers, that it has progressed by a staggering degree to the point where we’re almost ready to call it a finished MVP, and most excitingly, that we’re working hard on our last few tasks before we can begin the open beta! With so much work behind us, I thought it might be fun to look at some of how adventuring has changed. We hope you’ll be as excited as we are! Some of the differences are subtle, but it’s a lot easier to use, and more flexible. 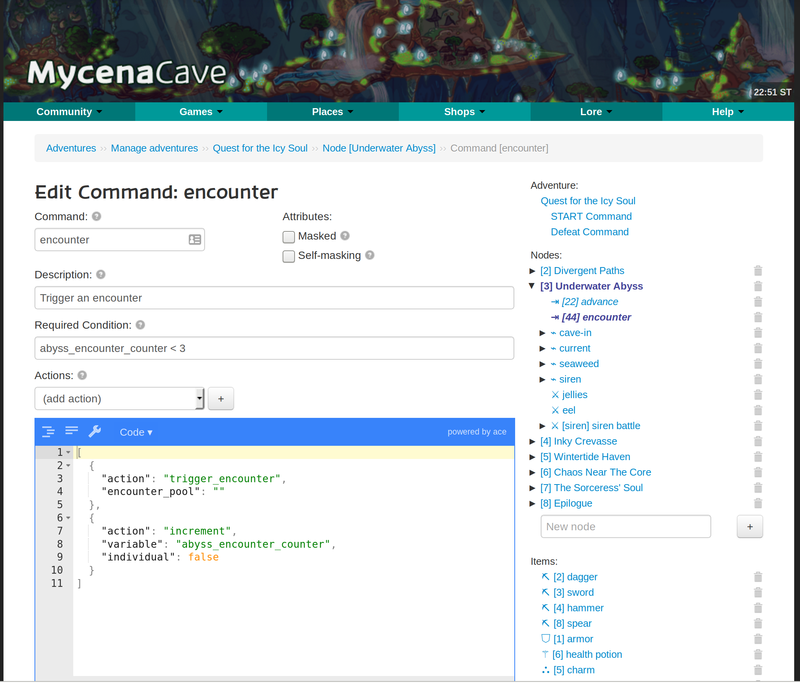 There are also a number of new tools built into the builder to help you keep track of your adventure and ensure that it’s correct and consistent. The adventuring interface hasn’t changed a whole lot, but there are a few notable differences between what it is now and what it was. The most noticeable of which is that die rolls are explicitly shown whenever they are rolled, as well as generally more information being displayed in status messages (current HP if altered, etc.). Damage types that are more than flavor, including resistances, vulnerabilities, etc. There’s a number of things still on the to-do list to implement, including things like passing adventure items between players, expanding the options for armor, having a correctness-verifier to make sure your adventure doesn’t have any obvious mistakes in it, and so on. One thing that struck us during the beta was how easy it was to get lost in the weeds. Putting together a small adventure isn’t terribly difficult, but it’s very hard to resist the seductive call to start planning out your 50-piece magnum opus with custom mechanics for everything under the sun, only to find that after doing the first 90% you then had to do the next 90% and a third 90%, and suddenly realize that really you’re still only about a fifth of the way there and please check back in six months. It’s far more difficult to say “I have all these great ideas that I won’t do today”, to point at an adventure, say “this is finished now” and click ‘publish’. 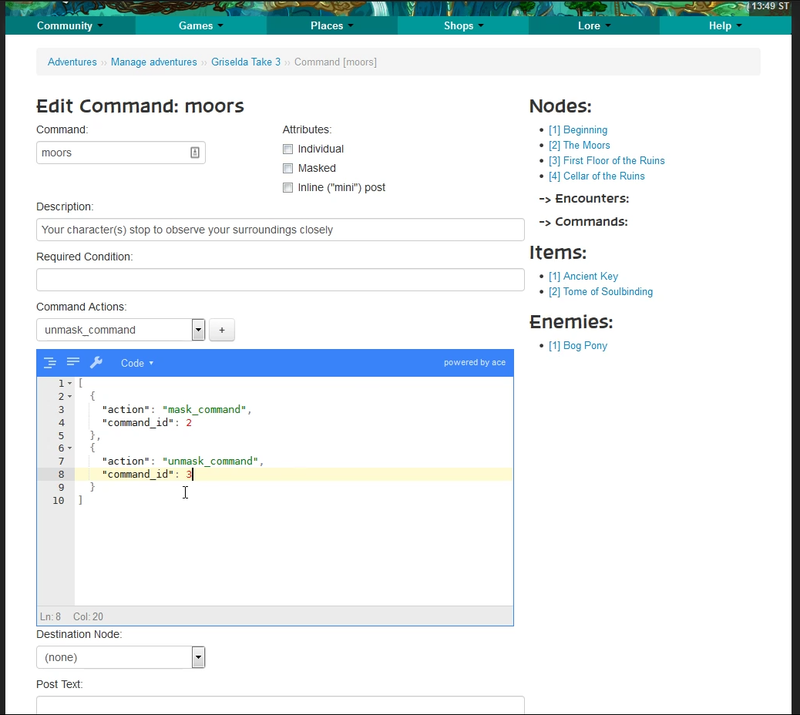 To that end, we’re working on a very hands-on guided introduction to it for when we launch the open beta. Since then, it has grown by an enormous degree: it turns out that making something more complex while simultaneously making it easier to use is a rather difficult task. To give you an idea of the insane task foisted upon our beta worldbuilders, back in February this thing was less of an Adventure Builder and more of a Quest-For-The-Icy-Soul Builder — amusingly, this was one of the hardest things to communicate to the beta testers at the beginning of the program, leading to questions like “you can add 1 to a number, but can’t subtract 1?” having answers like “I didn’t need to subtract anything in QftIS”. Making the Quest for the Icy Soul was easy in comparison: if I needed a new feature I’d code it up, but you can’t do that in a general builder: the Worldbuilders didn’t just need to think about what mechanics you’d need in an adventure, they quite literally had to think about what mechanics you’d need in order to build whatever mechanics someone else might need. It’s a shockingly difficult question to answer, and is to a large degree why this update has been months in the making. I’m so excited for the adventure system!!! 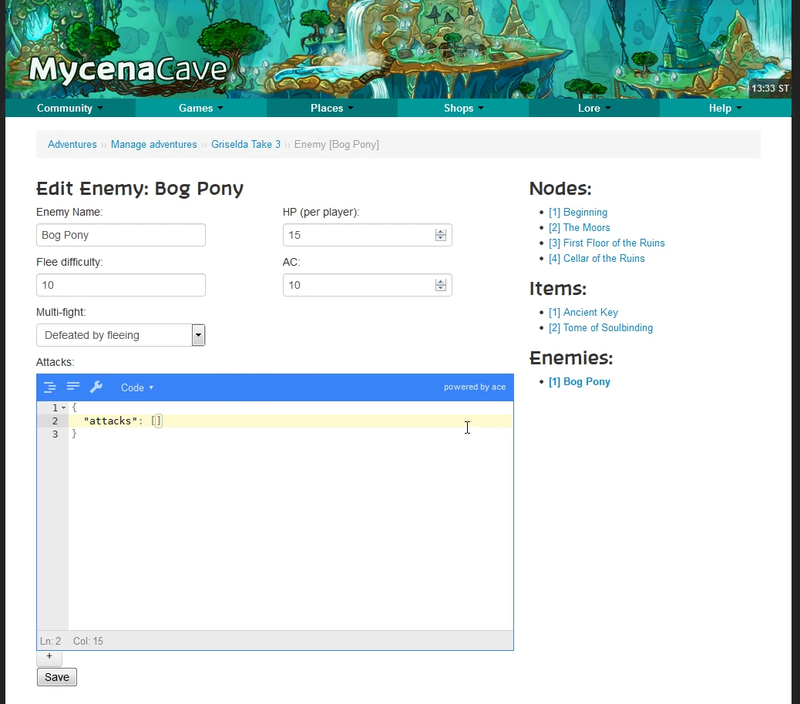 This looks like an amazing feature that could really set MycenaCave apart from other sites. I can’t think of any other one that has anything like this (other than whatever the players make with outside tools). Hype! I am so incredibly excited about this. Well done everyone on the hard work behind the scenes! Aaah! This is so exciting!! I don’t know if I expressed at any part of this how incredibly excited I am to be getting a feature like this. I only wish I had been a part of the beta, but hopefully I’ll have many chances to participate once it’s released. Like others said, this feature truly feels unique compared to so many other sites, and I can’t wait to see it fully in action! Wow, this all looks amazing!! I’m really proud of glitch and Myla and everyone who devoted their time to helping with the closed beta. You’re all rockstars! This feature is gonna be so amazing - I’m excited to go on adventures with everyone. This is amazing! Thank you so much for all your hard work! I can’t wait to get started! Very excited! It sounds like it’s going to be tons of fun! whoa neat! sounds like a lot of fun!! Oh man, I’m so excited for this! :D I can’t wait to see the final product! OMG! I loved Quest for the Icy Soul and the entire idea behind the adventure system, I’m super happy to see that’s it’s made progress! I feel like, even without knowing all of the details behind what’s changed, there’s been enormous progress in a relatively short amount of time! Thanks to everyone who’s developing and testing for all your hard work. 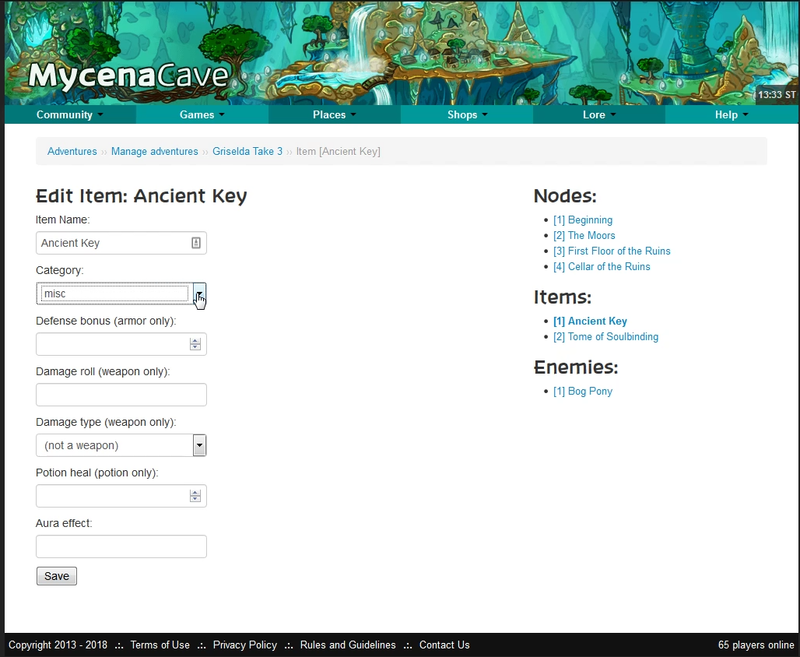 Clicking those blue buttons creates the item-related command in the dropdown and selects it for you, leaving it clean and holding only your actual adventure-specific commands unless you specifically need to do something with items.